BEAUTY BREAK. Yes please! Hehe. Well, who doesn't need it? So when I found out that Bioessence has invited us to visit them again to experience their version of a Beauty Break, I was thrilled! Every girl or guy needs a break every now and then and Bioessence has come up with such an awesome plan for those who desperately need a TIME OUT from their busy schedule and get "recharged" again in a short amount of time. So a Beauty Break (BB) is a 30 minute treatment. Its specially designed for those who are so busy at work or stressed and need a quick break to release the tension and stress that one is experiencing at that time. I don't know about you but for me, one of the ways I de-stress is by having a massage or having a "pamper me" time. So I can really relate to what Bioessence is offering. Miss Cha from Bioessence giving us some tips on how to de-Stress! 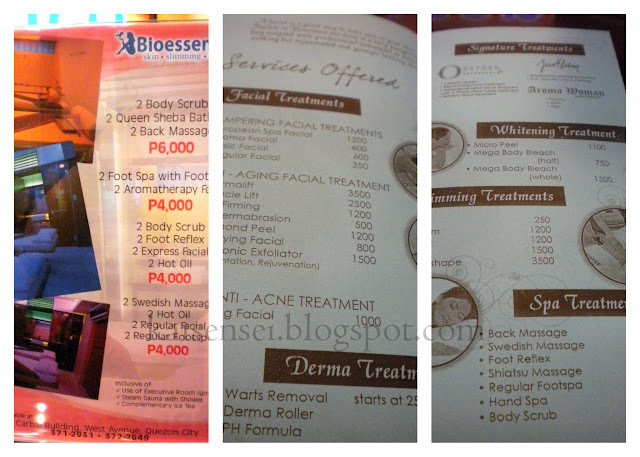 Since I've already been here at Bioessence, I didn't take the grand tour anymore. Since the Beauty Break Event was for bloggers, most of the others did take a look around. Then we all sat down to listen to a short lecture on the cause and effects of stress on our bodies. Some of the tell tale signs of stress can be attributed to hair fall, lack of sleep, and lack of water intake! I learned a lot during this talk and will definitely keep in mind the things I should do to avoid breaking down due to stress. The most complete 30 Minute pampering facial. This treatment includes, steam, extraction of blackheads, Vitmain C Cream, and back massage. After this, we all had to wait for our turn on the various treatments that they were going to let us try out. We were all offered a facial treatment, a back massage, and a foot reflex. Because I already had a facial from Bioessence just recently, I decided to opt not to do that but instead go for the massage and foot reflex. I had been really looking forward to having this back massage. I was given a "Shiatsu" type of massage which was a first for me. Like I mentioned earlier, whenever I am stressed -- one of the major de-stressing activities that I do is to get a massage. Usually, most of the masage parlors here in the Philippines offer a combination type of massage which would incorporate the Shiatsu, swedish, and "pinoy hilot" style. So technically, this is my first time to experience the Shiatsu massage which is a combination of medium pressure on acupressure points using the whole hand or fingers and also some stretching is also involved. What can I say about the massage? Well my face above says it all! I am happy and relaxed. I never thought that exerting pressure at the right places can remove stress and be so relaxing. Anyway after that, I had to wait with some other fab bloggers for our turn. 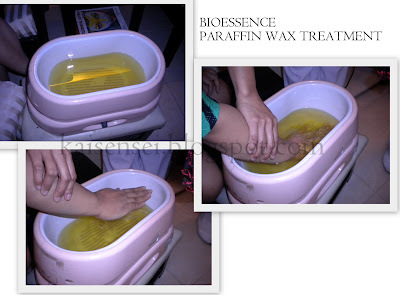 Most of the other bloggers during that time were already experiencing the wonders of Bioessence. Look who I stumbled upon -- Cha in one of the rooms and snapped a photo of her having a facial! During the wait, some of us were offered to try out their Hand Paraffin Wax Treatment. I've never had this treatment before but the fact that it was "wax" had really caught my interest. So I was pretty excited to try it out. So the first step to the treatment was to dip your whole hand inside the liquid paraffin wax. Having a low tolerance to pain, I was kinda feeling a bit scared and freaked out (I mean it is WAX after all!). Especially after watching the others do it before me. LOL. But I wanted to try it out especially after finding out the beneficial effects it has on oneself. ME psyching myself up that I can do this! No pain no gain! lol! My whole hand was submerged in the liquid wax. Oh boy it was really a shocker! The first dip was definitely hot! The attendant fanned my hand so that the wax will solidify. After that, my hand was dipped in the wax 3-4 times so that my hand was fully coated with the wax. It wasn't so bad after that. Then they wrapped my waxed hands with cling wrap for several minutes. The hand paraffin wax treatment is good for those who work a lot with their hands (aka for people always online and typing and using their latptop! lol). It is said that the treatment is good for your hands especially for those who have pasma. Also smoother hands anyone? Jen and Carizza showing off their paraffin wax treated hands! The best part of the treatment, when they slowly peeled off the wax off my hands! Then some lotion was added and my hand was treated to a wonderful massage. get if I spent the whole day standing up and on my feet. Pampered feet. Pampered hands. A back massage. A facial. A Beauty Break at Bioessence is definitely on my list of things to do when I am stressed. Carizza, Jen, Miss Anj, and Me! Many thanks to the wonderful and super accommodating staff of Bioessence West Ave. for treating us bloggers to this Beauty Break. Thank you Miss Anj and Bioessence for inviting us over! Check out what Bioessence has in store for you! So Coffeeholics, wanna have a taste of a Beauty Break by Bioessence? Then do drop by a Bioessence branch near you.You may call 376-7106 or 0918-8-BEAUTY for inquiries and appointments. Also, to check out their latest promos and offers, check out BIOESSENCE Facebook page and BIOESSENCE Twitter for more updates. Hope you all have a wonderful week! I'm still currently on the road of recovery from my asthma episodes. Yes, thank God I'm definitely getting better. See you all soon! mwah!